I first read this story way back then. “While suturing a cut on the hand of a 75 year old Texas rancher, whose hand was caught in a gate while working cattle, the doctor struck up a conversation with the old man. Eventually the topic got around to politics and then they discussed some new guy who was far too big for his shoes as a politician. The old rancher said, ‘Well, ya know, he is a post turtle’. 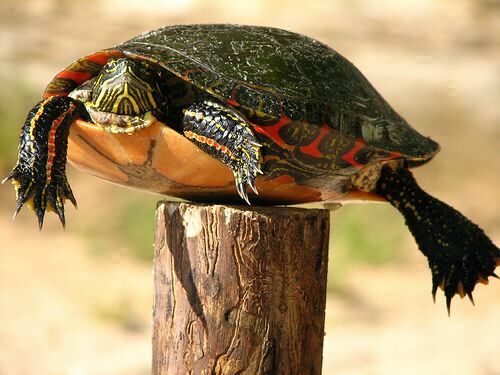 Not being familiar with the term, the doctor asked him what a ‘post turtle’ was. Insert Sunday, January 16, 2011 1:19 AM. Another friend just sent me this picture of an actual post turtle. I remembered the story and actually had to go into my archives when a friend emailed me to say they have had a post turtle making a speech somewhere in Arizona a few days ago, in a town named Twosun or somepin’ like that. This friend is a nice guy but he is also a practical joker, so I voice mailed and asked him. I declined but smiled. He is from Newtie’s country; they will tell you over and over “his Mama always called him Newtie.” They love Newtie down there and whatever they are fixin’ on doing most of the time involves either cat-fishing or hunting. It’s good to be there. This entry was posted on January 13, 2011 at 1:39 pm and is filed under Uncategorized. You can follow any responses to this entry through the RSS 2.0 feed. You can leave a response, or trackback from your own site. The Speech in Tucson left me speechless. The songs and praise from the Time journolists made me heave: only one had the guts to say: “Right Message, wrong moment.” All the others fell on their knees and started to grovel and pray. Joe Klein had himself two double orgasms in a row and groveled at the feat of Obama, once again wearing his Messiah Robes. What is he going to heal? He makes my heave. Or is he going to invite the bereaved ones for some beers with the killer, Eric Holder presiding? It’s going to be very interesting what they are going to do about the killer. Arizona does still have the death penalty, I think. And I am awaiting developments around the Wheeler Incident. Ike, Great post. Last night’s memorial, ah hem, pep rally had me shaking my head. The event was repulsive. I am not sure that we can shock the world anymore than we have this week. Our indoctrinated elitist yet clueless Progressive youth has shown the world just how misguided and hopeless they are. Obama politicized last night from the moment the venue was chosen. In so doing, he used six dead Americans, one of which is a 9 year old little girl as props for his dog and pony show. Thanks for dropping in twice and I also got this in the other Post. Thank you so much. Our only hope for America is that this freak will not sway any of the 46% who used their heads in 2008 and we got to work on getting some of the lost ones back with them to stand a chance in 2012. And we must hope that the GOP will stand as one in the two years ahead to thwart the crazy freak in any trick he tries to finally break the country apart before the election. I’ll read Joe’s stuff tomorrow, Ike–when my stomach’s empty. Yeah, you are right; actually I should have added a warning; be prepared to be real sick for a long time. But I know you are of the right stuff and will continue the fight. Dear Bob, Great minds think alike. One thing is for sure and that is that I will never receive such a t-shirt, not even as an act of mercy. Yes, those T-shirts. What will this guy not do to break America? It seems evident that he will stop at nothing. The one who put the turtle on the post in the first place is the one who caused all the comment. Not everyone knows that you have one of the sharpest brains in Blogosphere and I want to state that here and now for those who don’t know it. What a curious name, this blogo …..? Paragraph one needs clarification; at this stage we don’t know which turtle or which fence post is under discussion, unless you wish to enlighten us. To answer on you second paragraph would first require the answer to the first paragraph. I received the post turtle picture and inserted it in the Post.